Expression of IL-7Rα (CD127) has been suggested as a major determinant in the survival of memory T cell precursors. We investigated whether constitutive expression of IL-7Rα on T cells increased expansion and/or decreased contraction of endogenous Ag-specific CD4 and CD8 T cells following infection with Listeria monocytogenes. The results indicate that constitutive expression of IL-7Rα alone was not enough to impart an expansion or survival advantage to CD8 T cells responding to infection, and did not increase memory CD8 T cell numbers over those observed in wild-type controls. Constitutive expression of IL-7Rα did allow for slightly prolonged expansion of Ag-specific CD4 T cells; however, it did not alter the contraction phase or protect against the waning of memory T cell numbers at later times after infection. Memory CD4 and CD8 T cells generated in IL-7Rα transgenic mice expanded similarly to wild-type T cells after secondary infection, and immunized IL-7Rα transgenic mice were fully protected against lethal bacterial challenge demonstrating that constitutive expression of IL-7Rα does not impair, or markedly improve memory/secondary effector T cell function. These results indicate that expression of IL-7Rα alone does not support increased survival of effector Ag-specific CD4 or CD8 T cells into the memory phase following bacterial infection. Generation of memory CD4 and CD8 T cells that are capable of providing protection to the host against secondary pathogen challenge remains the ultimate goal of vaccination. After encountering Ag and receiving requisite costimulatory signals, naive T cell precursors undergo rapid expansion culminating in a peak in numbers after 5–7 days. Following expansion, Ag-specific T cells enter the contraction phase during which 90–95% of the cells die via apoptosis. The small subset of T cells that survive contraction are the initial memory cells, which will evolve into the long-term, self-sustaining memory population capable of providing protection against future infection (1). To incorporate optimal memory T cell development into vaccine design, the factors responsible for the selection of effector cells that survive the contraction phase following Ag-induced expansion to seed the initial memory pool must be understood. IL-7 has long been known to be required for the survival and homeostatic proliferation of naive T cells (2, 3, 4, 5). More recently, IL-7 has been implicated as a prosurvival cytokine important for early memory CD8 T cell selection and maintenance (6, 7, 8). IL-7Rα is dynamically regulated and has been shown to be potently down-regulated by human peripheral blood lymphocytes in response to treatment with IL-2 (9). Up-regulation of IL-7Rα in B and T lymphocytes is dependent, at least in part, on the Ets family transcription factors PU.1 (10) and GABP (11). It has been demonstrated (6, 7) in some model systems that expression of IL-7Rα by Ag-specific CD8 T cells at the peak of expansion identifies a population enriched in memory cell precursors. However, it is still not completely clear how absolute a role IL-7Rα expression plays in selecting memory CD8 T cell precursors, because it has also been demonstrated that under some circumstances IL-7Rα+ cells die during the contraction phase (12, 13) and IL-7Rαlow cells can survive contraction (14). A recent report addressed this question directly and demonstrated that constitutive expression of IL-7Rα in P14 transgenic CD8 T cells, specific for the glycoprotein33–41 epitope from lymphocytic choriomeningitis virus did not lead to increased survival of cells during the contraction phase following viral infection. This report also found no major differences in the expression of surface markers that would indicate a more rapid generation of a memory phenotype in cells with constitutive expression of IL-7Rα suggesting that the unwavering ability to signal through the IL-7R does not significantly alter the developmental fate of Ag-specific CD8 T cells (15). The importance of IL-7/IL-7R signaling in the regulation of CD4 T cell responses has also been established. IL-7R signaling is required for the generation of an Ag-specific CD4 T cell response following L. monocytogenes infection. Mice with a knock-in mutation in IL-7Rα (IL-7Rα449F) that has been shown to prevent STAT5 activation (16) have normal thymocyte and peripheral T cell development, but do not make a detectable CD4 T cell response after bacterial infection. Ag-specific CD8 T cells are generated in these mice, but memory is poorly maintained despite Bcl-2 expression that is similar to that detected in wild-type (WT)3 Ag-specific CD8 T cells (17). IL-7 is required for the long-term maintenance of memory CD4 T cells (18, 19) and it has recently been shown that signals delivered by IL-2 early during activation institute a program that results in re-expression of IL-7Rα at later times during the response. When primed with peptide-coated dendritic cells in the absence of IL-2 or IL-2Rα, CD4 T cells do not re-express IL-7Rα, which results in poor survival of memory CD4 T cells (20). It has not previously been investigated how constitutive expression of IL-7Rα by Ag-specific CD4 T cells would influence contraction/memory cell selection of this population. In the current study, we used mice with constitutive expression of IL-7Rα in T cells to study what effect this had on the response kinetics of endogenous Ag-specific CD4 and CD8 T cell responses following infection of mice with L. monocytogenes. Specifically, we tested the hypothesis that IL-7Rα was the sole selective factor for memory cell precursors by investigating whether constitutive expression of IL-7Rα resulted in increased survival of endogenous Ag-specific CD4 and CD8 T cells during the contraction phase following bacterial infection. Importantly, we also examined the ability of memory Ag-specific CD4 and CD8 T cells generated in IL-7Rα transgenic (Tg) mice to protect and undergo secondary expansion after lethal bacterial challenge. Our results support and extend the conclusion of the previous study using P14 Tg CD8 T cells (15) and show that constitutive expression of IL-7Rα does not impart an expansion, or survival advantage to endogenous Ag-specific CD8 T cells, nor do IL-7Rα Tg Ag-specific CD8 T cells exhibit any major changes in phenotype indicative of altered memory development after bacterial infection. In addition, our results demonstrate that constitutive expression of IL-7Rα results in slightly prolonged expansion of Ag-specific CD4 T cells compared with WT T cells; however, there was no overall survival benefit and no protection from waning memory levels at later times after infection. Memory IL-7Rα Tg Ag-specific CD4 and CD8 T cells expanded appropriately after secondary bacterial challenge and immunized IL-7Rα Tg mice were fully protected. Overall, our data support the conclusion that expression of IL-7Rα by itself is not sufficient to promote survival of effector T cells during the contraction and memory phases following infection. To create IL-7Rα transgenic mice, murine IL-7Rα cDNA was amplified from mouse splenic T cells by RT-PCR, and the sequence was verified after cloning into pCR2.1 vector by TA cloning (Invitrogen). The cDNA was then subcloned into a CD4 enhancer/promoter transgenic vector (21), which lacks the CD4 silencer located in intron 1 and thus directs transgene expression in T lineage cells (Fig. 1⇓A). The plasmid harboring the IL-7Rα cDNA was then linearized and injected into C57BL/6 oocytes. The progenies were screened for the presence of the transgene by Southern blotting (data not shown). Two positive mice were used as founders and bred on the C57BL/6 background. All the infection experiments were done on mice after four to five generations of backcrossing. WT mice in these experiments were littermate controls. L. monocytogenes-infected mice were housed in accordance with biosafety regulations. All animal experiments followed approved Institutional Animal Care and Use Committee protocols. 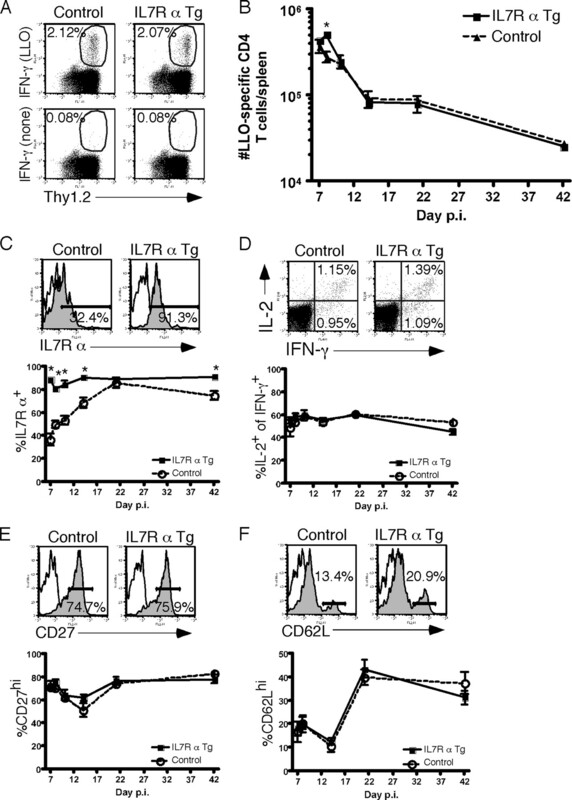 IL-7Rα Tg mice have increased expression of IL-7Rα in developing and mature T cells. A, Schematic showing the structure of transgenic constructs. B, Increased expression of IL-7Rα in the Tg mice. Thymocytes and splenocytes were isolated from IL-7Rα Tg mice and littermate controls, and stained with anti-CD4, CD8, and IL-7Rα Abs. 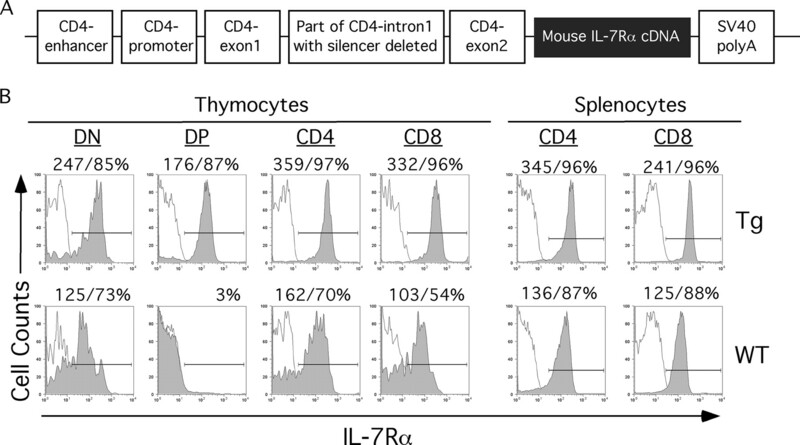 The expression levels of IL-7Rα on thymocyte subsets and splenic CD4 and CD8 T cells are shown, presented by mean fluorescence intensities and percentages of IL-7Rα-expressing cells. Representatives from at least three independent experiments are shown. Shaded histograms are IL-7Rα staining and open histograms are isotype control staining. L. monocytogenes that expresses OVA was a gift from Dr. Hao Shen (University of Pennsylvania, Philadelphia, PA) and Dr. Leo Lefrancois (University of Connecticut, Farmington, CT) (22). An attenuated version of this strain was created by introducing an in-frame deletion in the actA gene as previously described (23) (referred to as actA− LM-OVA). IL-7Rα Tg and control littermates were given a primary infection of 5 × 106 actA- LM-OVA. Immunized mice (day 42 after primary infection) were challenged with 7 × 105 virulent LM-OVA. Bacteria were grown and quantified as previously described (24, 25). All infections were performed via i.v. injection. The number of LM-OVA present in the spleens and livers of challenged mice was determined on day 3 following infection as previously described (24). The following Abs were used to stain for surface markers in combination with intracellular cytokines to identify Ag-specific T cells: PerCP anti-mouse CD4 (clone RM4–5), PerCP anti-mouse CD8 (clone Ly-2), FITC anti-mouse Thy 1.2 (clone 53–2.1), PE anti-mouse CD27 (clone LG.3A10), PE anti-mouse CD43 (clone 1B11), PE anti-mouse CD62L (clone MEL-14), PE anti-mouse CD127 (clone 12–1271-83′; eBioscience), PE anti-mouse IL-2 (clone JES6–5H4; BioLegend), allophycocyanin anti-mouse IFN-γ (clone XMG1.2; BioLegend). All Abs were from BD Pharmingen unless indicated otherwise. To prevent cleavage of surface CD62L during peptide stimulation, cells were preincubated with 0.1 mM TAPI-2 (Peptides International) for 30 min before the addition of peptide as previously described (26). Ag-specific CD4 and CD8 T cells were detected by intracellular staining for IFN-γ and, in some cases IL-2, as previously described (27) after a 5.5-h stimulation with either 5 μM listeriolysin O (LLO)190–201 (NEKYAQAYPNVS) or 200 nM OVA257–264 (SIINFEKL) peptide in the presence of brefeldin A (BioLegend). The total number of Ag-specific T cells per spleen was calculated by multiplying the frequency of CD4 or CD8+Thy1.2+IFN-γ+ cells after stimulation with specific peptide by the total number of splenocytes. The number of cells producing cytokine in the absence of peptide was subtracted. MHC class I tetramers specific for OVA257–264 were prepared according to published protocols (28). The method used to detect intracellular phospho-STATs has been previously described (29), but was modified slightly to incorporate tetramer staining to detect Ag-specific CD8 T cells. In short, splenocytes from Tg and WT control mice were rested at 37°C in medium containing 2% serum for 2 h before stimulation with 5 ng/ml rIL-7 (R&D Systems) or IL-15 (PeproTech) for 30 min. Following stimulation, cells were surface stained with APC-OVA257–264 tetramer and PerCP anti-mouse CD8 (clone Ly-2) for 30 min on ice, washed once, then processed for intracellular staining as previously described (29). Abs used were rabbit anti-mouse phospho STAT 5 (Y694) (Cell Signaling Technology) and Alexa Fluor 488 F(ab)2 fragment of goat anti-rabbit IgG (Invitrogen). Samples were analyzed by flow cytometry on a FACS Calibur (BD Biosciences) immediately following the completion of staining. To achieve ectopic expression of IL-7Rα specifically in T cells, we used a CD4 enhancer/promoter transgenic vector (21). This vector fused the CD4 enhancer and CD4 promoter, and also contained a deletion of a silencer in intron 1 that allowed the transgene to be expressed in both CD4 and CD8 T cells (Fig. 1⇑A). The construct was injected into oocytes, and two founder lines were established. IL-7Rα expression is dynamically regulated during thymus ontogeny. IL-7Rα in nontransgenic controls was highly expressed in most immature thymocytes that were double negative for CD4 and CD8 expression, completely turned off in CD4 and CD8 double positive (DP) thymocytes, and up-regulated again in CD4 or CD8 single positive cells (30). The expression of IL-7Rα persisted in mature CD4 and CD8 T cells where it maintains naive T cell survival and homeostasis (5, 31). In IL-7Rα Tg mice, IL-7Rα expression was increased throughout thymocyte development, especially in DP thymocytes (Fig. 1⇑B). The expression of IL-7Rα in splenic T cells was also increased based on mean fluorescence intensity. Consistent with previous findings (32), constitutive expression of IL-7Rα resulted in a slight decrease of thymic cellularity at 6–8 wk of age (97.4 ± 15.4 × 106 in Tg and 146.7 ± 13.2 × 106 in WT; n = 8), probably due to the increased consumption of IL-7 by IL-7Rα-expressing DP cells. However, this did not alter the output of T cells in the periphery. Total numbers of splenocytes were not statistically different between Tg and WT mice 6–10 wk of age (3.9 ± 1.2 × 107 and 5.0 ± 1.1 × 107, respectively; p = 0.13). Total numbers of CD4 (7.5 ± 1.7 × 106 in Tg and 7.1 ± 1.3 × 106 in WT mice; p = 0.67) and CD8 T cells (4.2 ± 0.7 × 106 in Tg and 4.1 ± 1.0 × 106 in WT mice; p = 0.82) were also not different. Both founder lines of Tg mice showed indistinguishable IL-7Rα expression levels and patterns, and thus the following infection experiments were done on one line only. Expression of IL-7Rα by a small frequency of effector CD8 T cells at the peak of Ag-induced expansion has been suggested to permit these cells to survive the contraction phase and become memory Ag-specific CD8 T cells (6, 7). Also, signals transmitted through the intracellular domains of the IL-7R (α- and γc-chains) appear to enhance expansion of Ag-specific T cells after viral infection (33). IL-7Rα Tg mice were infected with L. monocytogenes to determine whether constitutive expression of IL-7Rα on endogenous CD8 T cells would result in increased memory development due to greater expansion, decreased contraction, or both. The IL-7Rα Tg and WT littermate control mice were on a C57BL/6 background; therefore, actA− LM-OVA was used to infect the mice so the OVA257–264-specific CD8 T cell could be tracked using intracellular cytokine staining for IFN-γ. As shown in Fig. 2⇓A, there were nearly equivalent frequencies of OVA257–264-specific CD8 T cells in representative WT and IL-7Rα Tg mice on day 7 post infection (p.i.). This translated into similar total numbers of OVA257–264-specific CD8 T cells in the spleens of control and Tg mice at all time points evaluated (from days 7 to 42) after primary infection with actA− LM-OVA (Fig. 2⇓B). These results confirm the findings presented in an earlier report (15), which demonstrated no survival advantage in IL-7Rα Tg P14 T cells during contraction after viral infection, and extend the same conclusions to the endogenous CD8 T cell response in a bacterial infection model. Constitutive expression of IL-7Rα does not prevent contraction of Ag-specific CD8 T cells. IL-7Rα Tg and control mice were infected with actA− LM-OVA and the response to OVA257–264 was monitored in the spleen at several times p.i. using intracellular cytokine staining for IFN-γ. A, Example of ICS for IFN-γ at day 7 p.i. Dot plots were first gated on CD8+ cells. Frequencies are Thy 1.2+IFN-γ+ cells within the CD8+ population. B, Total number of OVA257–264-specific CD8 T cells in the spleens of IL-7Rα Tg (squares) and control (triangles) mice at the days p.i. indicated on the x-axis calculated as described in the Materials and Methods section. Each time point is an average of three to six mice. C, D, F–H, Expression of surface markers on OVA257–264-specific CD8 T cells. Histograms are all examples of staining on day 7 p.i. and are first gated on CD8+Thy 1.2+IFN-γ+ cells. Open histograms are isotype Ab staining. Shaded histograms are staining for the marker indicated on the x-axes of the histograms. Frequencies represent the frequency of CD8+Thy 1.2+IFN-γ+ cells within the gate shown. Graphs are frequencies of gated cells at the times p.i. indicated on the x- axes. Each time point is an average of 3–6 mice. The * symbol indicates that the values for IL-7Rα Tg and WT mice on that time point were significantly different (p < 0.05) as determined by unpaired t test. E, Dot plots are examples of staining on d7 p.i. and are first gated on CD8+Thy 1.2+ cells. Frequencies are IFN-γ+ or IFN-γ+IL-2+ cells within the CD8+Thy 1.2+ population. Graph is frequency of IL-2+ cells within the CD8+Thy 1.2+IFN-γ+ (Ag-specific) populations at the times p.i. indicated on the x-axis. Each time point is an average of three to six mice. Given that IL-7Rα expression has been implicated in identifying memory CD8 T cell precursors we next wanted to determine whether constitutive expression of IL-7Rα would alter the progression of endogenous OVA257–264-specific CD8 T cells from an effector phenotype to a memory phenotype. We evaluated OVA257–264-specific CD8 T cells in WT and IL-7Rα Tg mice for expression of several surface markers that are normally associated with a memory-like phenotype at several times p.i. Representative profiles for Ag-specific (CD8+Thy1.2+IFN-γ+) WT and IL-7Rα Tg mice day 7 p.i. are shown in Fig. 2⇑, C–H (top), whereas time course data from multiple mice are shown in bottom graphs. As expected there was significant down-regulation of IL-7Rα by WT Ag-specific CD8 T cells during their expansion followed by gradual reacquisition of IL-7Rα expression as the cells progressed to memory. IL-7Rα expression in the Tg mice was relatively stable and consistently higher than in WT mice (Fig. 2⇑C). There was slight down-regulation of IL-7Rα by Ag-specific CD8 T cells in Tg mice, which was especially notable on day 10 p.i. This could be the result of down-regulation of nontransgene derived IL-7Rα, or a limitation of the Ab used to detect surface expression. We do not feel that this is significant to the interpretation of the results because the Tg T cells still expressed much higher levels of IL-7Rα compared with WT T cells at times p.i. that corresponded to the contraction phase. In addition, as will be discussed later, Tg T cells were capable of receiving IL-7 signals during the contraction phase whereas WT T cells were not (Fig. 3⇓). Despite the disparity in IL-7Rα expression, there were no significant differences in the frequency of KLRG1+ (Fig. 2⇑D), IL-2+ (Fig. 2⇑E), CD27high (Fig. 2⇑F), CD43high (Fig. 2⇑G), or CD62Lhigh (Fig. 2⇑H) OVA257–264-specific CD8 T cells between WT and IL-7Rα Tg mice on day 7 p.i. or any other day that was analyzed, suggesting that constitutive expression of IL-7Rα does not dramatically alter the rate at which Ag-specific CD8 T cells acquire memory characteristics. The Tg IL-7Rα transduces IL-7 signals to Ag-specific CD8 T cells during contraction and does not alter the ability of these cells to make IFN-γ after peptide stimulation. IL-7Rα Tg and control mice were infected with actA− LM-OVA and the response to OVA257–264 was monitored in the spleens at day 7, day 11, and day 14 p.i. using MHC class I tetramer staining and ICS for IFN-γ on splenocytes from the same mice in parallel. A, Representative example of MHC class I tetramer staining on splenocytes from mice day 7 p.i. Dot plots were first gated on CD8+ cells. Frequencies are Thy 1.2+/Tetramer+ cells within the CD8+ population. B, Total numbers of OVA257–264-specific CD8 T cells calculated using MHC class I tetramer staining (triangles) or ICS for IFN-γ (circles) in the samples indicated on the x-axis. There were three mice per group per time point. C–E, Intracellular staining for phospho-STAT5 on day 7 (C), day 11 (D), and day 14 (E) p.i. All histograms are gated on OVA257–264-tetramer positive cells. Shaded histograms are phospho-STAT5 staining of unstimulated T cells. Open histograms are phospho-STAT5 staining of cells stimulated with the cytokine indicated in the upper right hand corner of the histogram overlay. The histograms presented are representative of three mice per group per time point. Enumerating Ag-specific CD8 T cells using intracellular cytokine staining (ICS) for IFN-γ after peptide stimulation assumes that there would not be a difference in the ability of Tg and WT T cells to respond to Ag by making this important effector cytokine. To physically, rather than functionally, show that there were no differences in expansion or contraction of Ag-specific CD8 T cells between Tg and WT control mice we tracked the OVA257–264 response after actA− LM-OVA infection using MHC class I tetramers and ICS for IFN-γ in parallel. As presented in Fig. 3⇑A, the tetramer clearly identified OVA257–264-specific CD8 T cells and this staining showed nearly identical frequencies of Ag-specific CD8 T cells in Tg and WT control mice day 7 p.i. indicating that there was similar expansion in both sets of mice. When the total numbers of Ag-specific CD8 T cells were determined in the same splenocyte preparations generated from Tg and WT mice using either MHC class I tetramer staining or ICS for IFN-γ on days 7, 11, and 14 p.i. there was no statistical difference between the numbers generated using either methodology (Fig. 3⇑B). These data indicate that that the Tg IL-7Rα-chain does not alter the ability of the Tg T cells to make IFN-γ after peptide stimulation and confirm the previous conclusion that there are no differences in expansion or contraction between the Tg and WT Ag-specific CD8 T cells. We next wanted to demonstrate that the Tg IL-7Rα-chain was functional and that its expression resulted in the ability of Tg Ag-specific CD8 T cells to receive IL-7 signals during the contraction phase when the majority of WT T cells could not. To accomplish this, we combined tetramer staining with intracellular staining for phospho-STAT5 after IL-7 stimulation of splenocytes from mice days 7, 11, and 14 p.i. The Tg IL-7Rα-chain expressed by Ag-specific CD8 T cells was fully functional as demonstrated by the shift in phospho-STAT5 staining after stimulation of splenocytes from mice day 7 p.i. with IL-7 (Fig. 3⇑C). 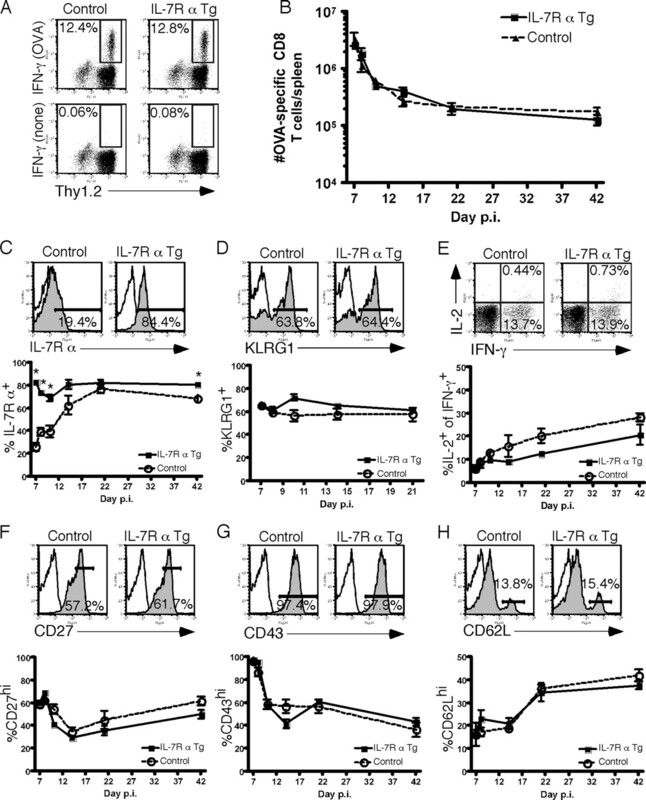 The level of IL-7 responsiveness in the Tg T cells did not change appreciably from day 7 through day 14 p.i., (Fig. 3⇑, C–E), which was predicted because the level of IL-7Rα did not change dramatically on the cells at these times p.i. (Fig. 2⇑C). In contrast, WT Ag-specific CD8 T cells were unresponsive to IL-7 on day 7 p.i. (Fig. 3⇑C), most likely due to significant down-regulation of IL-7Rα at this time point. As the cells progressed through the contraction phase, and progressively up-regulated IL-7Rα, their level of IL-7 responsiveness increased as demonstrated by the shift in phospho-STAT5 detected after stimulation with IL-7 (Fig. 3⇑, D and E). 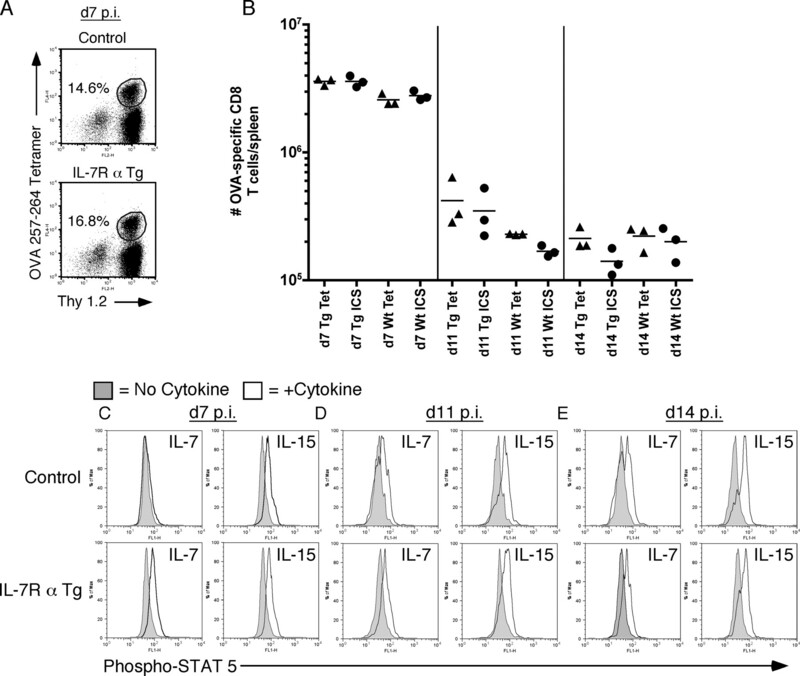 Both Tg and WT Ag-specific CD8 T cells did not change their level of responsiveness to IL-15 during the contraction phase, indicating that phospho-STAT5 could be detected in WT cells if the cytokine receptor was present (Fig. 3⇑, C–E). The ability to respond to IL-15 also demonstrated that Tg T cells were receptive to another cytokine whose receptor included the γc and the expression of the Tg IL-7Rα-chain was not sequestering all available γc expressed by the cells. Tg T cells also responded to IL-2 and IL-4 similarly to WT Ag-specific CD8 T cells (data not shown). In summary, these data demonstrate that, despite the consistent expression of a fully functional IL-7Rα-chain, Tg Ag-specific CD8 T cells exhibit a pattern of expansion and contraction after L. monocytogenes infection that is nearly indistinguishable from WT T cells. IL-7 has also been shown to be important for the development of long-lived memory CD4 T cells (18, 19, 34). Thus, we also evaluated the CD4 T cell response to LLO190–201 in IL-7Rα Tg and WT mice. Similar to what was observed with CD8 T cell responses, there were nearly identical frequencies and total numbers of LLO190–201-specific CD4 T cells in WT and IL-7Rα Tg mice d7 p.i. (Fig. 4⇓A) despite vastly different expression patterns of IL-7Rα at this time point (Fig. 4⇓C). In contrast to Ag-specific CD8 T cells, IL-7Rα Tg LLO190–201-specific CD4 T cells continued to expand until day 8 p.i., whereas the WT T cells had already started to contract at this time point indicating that constitutive expression of IL-7Rα prolonged the ability of CD4 T cells to expand following activation with Ag. However, this increased ability to proliferate was short-lived because by day 10 p.i. both WT and IL-7Rα Tg LLO190–201-specific CD4 T cells had dramatically contracted (Fig. 4⇓B). Of note, constitutive expression of IL-7Rα throughout their development and transition to memory was also unable to protect memory Ag-specific CD4 T cells from slowly decaying over time at the same rate as WT T cells. These results indicate that, although IL-7Rα Tg Ag-specific CD4 T cells did exhibit a slightly prolonged expansion phase, overall, constitutive expression of IL-7Rα did not permit increased survival of T cells during the contraction phase or generation of a more stable long-term memory Ag-specific CD4 T cell population. IL-7Rα Tg CD4 T cells expand slightly longer than control T cells, but contract normally. IL-7Rα Tg and control mice were infected with actA− LM-OVA and the response to LLO190–201 was monitored in the spleen at several times p.i. using intracellular cytokine staining for IFN-γ. A, Example of ICS for IFN-γ at day 7 p.i. Dot plots were first gated on CD4+ cells. Frequencies are Thy 1.2+IFN-γ+ cells within the CD4+ population. B, Total number of LLO190–201-specific CD4 T cells in the spleens of IL-7Rα Tg (squares) and control (triangles) mice at the days p.i. indicated on the x-axis calculated as described in the Materials and Methods section. Each time point is an average of three to six mice. C, E–F, Expression of surface markers on LLO190–201-specific CD4 T cells. Histograms are all examples of staining on day 7 p.i. and are first gated on CD4+Thy 1.2+IFN-γ+ cells. Open histograms are isotype Ab staining. Shaded histograms are staining for the marker indicated on the x-axes of the histograms. Frequencies represent the frequency of CD4+Thy 1.2+IFN-γ+ cells within the gate shown. Graphs are frequencies of gated cells at the times p.i. indicated on the x-axes. Each time point is an average of three to six mice. The asterisk (∗) indicates that the values for IL-7Rα Tg and WT mice on that time point were significantly different (p < 0.05) as determined by unpaired t test. D, Dot plots are examples of staining on day 7 p.i. and are first gated on CD4+Thy 1.2+ cells. Frequencies are IFN-γ+ or IFN-γ+IL-2+ cells within the CD4+Thy 1.2+ population. Graph is frequency of IL-2+ cells within the CD4+Thy 1.2+IFN-γ+ (Ag-specific) populations at the times p.i. indicated on the x-axis. Each time point is an average of three to six mice. We also evaluated LLO190–201-specific CD4 T cells for expression of a panel of markers to determine whether constitutive expression of IL-7Rα altered the phenotype of responding cells. Despite a consistently high expression of IL-7Rα, we did not detect a significant difference in frequency of IL-2+ (Fig. 3⇑D), CD27high (Fig. 4⇑E), or CD62Lhigh (Fig. 4⇑F) IL-7Rα Tg LLO190–201-specific CD4 T cells compared with WT T cells. Thus, IL-7Rα expression by itself cannot dictate memory Ag-specific CD4 T cell development. We wanted to determine whether memory T cells generated in the IL-7Rα Tg mice were of sufficient quality to expand normally after secondary infection and provide protection equally as well as the same number of WT memory T cells. Immunized WT and IL-7Rα Tg mice were challenged with 7 × 105 virulent LM-OVA (∼7 LD50) day 42 after primary infection. Secondary T cell expansion was determined by intracellular cytokine staining on day 5 p.i. (Fig. 5⇓, A and B) and protection was determined by evaluating bacterial numbers (CFUs) in spleens (Fig. 5⇓C) and livers (Fig. 5⇓D) of naive and immunized mice on day 3 postchallenge. Both IL-7Rα Tg LLO190–201-specific CD4 (Fig. 5⇓A) and IL-7Rα Tg OVA257–264-specific CD8 (Fig. 5⇓B) T cells expanded after secondary infection. The degree of expansion was similar to what was observed in WT mice. Immunized IL-7Rα Tg mice were as equally protected as WT mice, which is indicated by the CFU counts in the spleens (Fig. 5⇓C) and livers (Fig. 5⇓D) of challenged mice day 3 p.i. Naive mice challenged with the same dose of LM-OVA had succumbed to infection by this time point, which is generally associated with a high number (>108) of bacteria in each organ. These results suggest that constitutive expression of IL-7Rα on memory T cells does not impede, nor improve, secondary expansion and protection from lethal virulent bacterial challenge. IL-7Rα Tg Ag-specific T cells expand after secondary infection and convey protection. Immunized IL-7Rα Tg and control mice day 42 after primary infection were challenged with a high dose of virulent LM-OVA. A, Memory levels and secondary expansion of LLO190–201-specific CD4 T cells in the spleens of control (filled bars) and IL-7Rα Tg (striped bars) mice 5 days after challenge. Numbers of Ag-specific T cells were determined using ICS for IFN-γ. Three mice were used in each group. B, Memory levels and secondary expansion of OVA257–264-specific CD8 T cells in the spleens of control (filled bars) and IL-7Rα Tg (striped bars) mice 5 days after challenge. Numbers of Ag-specific T cells were determined using ICS for IFN-γ. Three mice were used in each group. C, CFU counts in the spleens of control (triangles) and IL-7Rα Tg (circles) mice day 3 post challenge. Each symbol represents one mouse. Data are reported as number of CFU/spleen of each animal. LOD, Limit of detection. D, CFU counts in the livers of control (triangles) and IL-7Rα Tg (circles) mice day 3 post challenge. Each symbol represents one mouse. Data are reported as number of CFU/g liver. T cells rely on survival signals to navigate through thymic developmental stages, to endure in the periphery until called upon to respond to Ags, to persist during the contraction phase to become long-lived memory cells, and to maintain memory cell numbers for periods of time that can approach the lifespan of the host. Before methods can be developed to improve the survival of beneficial T cells, such as memory T cells, and to eliminate excess T cells, such as after pathogen clearance, we must first understand what, how, and when survival signals are delivered to T cells. IL-7 is an important survival cytokine for T cells during multiple phases of their existence. Early reports suggested that IL-7Rα expression marked early memory precursors at the peak of expansion (6, 7). However, until recently it had not been directly tested whether expression of IL-7Rα alone was the sole factor that determined which cells survive contraction after Ag-induced expansion to become memory cells, and which cells die. Our results substantiate recent findings, that IL-7Rα alone does not permit survival of Ag-specific CD8 T cells during contraction (Ref. 15 and Fig. 2⇑). In addition, our study provides evidence that constitutive IL-7Rα expression by Ag-specific CD4 T cells also does not increase survival of this population during contraction (Fig. 4⇑). Effector CD4 and CD8 T cells with constitutive expression of IL-7Rα acquired a memory phenotype, as determined by CD27, CD43, CD62L, and IL-2 staining, with the same kinetics as WT T cells indicating that persistent IL-7Rα expression does not change the developmental pattern of Ag-specific memory cells. Thus, IL-7Rα expression itself does not determine memory cell development. It has been demonstrated in a recent study that surface expression and mRNA levels of IL-7Rα are specifically down-regulated in lymph node-derived CD4 and CD8 T cells after in vitro culture with the prosurvival cytokines IL-2, IL-4, IL-6, IL-7, and IL-15 (35). It was suggested that this suppression of IL-7Rα was a mechanism to preserve the availability of IL-7 for T cells that had not received recent survival signals and was important for the maintenance of naive T cells because lower numbers of splenocytes were found in mice with over-expression of a IL-7Rα transgene (35). In our experiments, age-matched IL-7Rα Tg and WT littermate control mice did not have statistically different numbers of CD4 or CD8 T cells in their spleens suggesting that the inability to down-regulate IL-7Rα did not create an imbalance of available IL-7 for the maintenance of naive T cells. It seems unlikely that limited availability of IL-7 is what ultimately determines the number of T cells that survive. In preliminary experiments using real-time PCR, we detected stable amounts of IL-7 mRNA in the spleen days 1–10 after L. monocytogenes infection that were ∼2–5-fold decreased when compared with a naive spleen sample (data not shown). In another study, treatment with exogenous IL-7 after vaccinia virus infection did prolong the survival of Ag-specific CD4 T cells; however, neutralization of IL-7 did not increase the frequency of cells that underwent contraction (36). These data would suggest that limiting availability of IL-7 does not fully explain the selection of memory CD4 T cells. The dynamic pattern of IL-7Rα expression demonstrated by Ag-specific CD8 T cells has been shown to be independent of IL-7 following vesicular stomatitis virus infection. Therefore, in this model, IL-7Rα expressing cells are not selected by IL-7 binding to the receptor (37). It remains to be determined whether cognate Ag recognition directly influences IL-7Rα expression, or whether there is also down-regulation of IL-7Rα by bystander T cells after an infection. It has been shown that the inflammatory environment that exists during Ag-specific CD8 T cell priming influences the expression of IL-7Rα. When T cells are primed with peptide-coated DCs, or in antibiotic pretreated mice infected with L. monocytogenes, both of which represent a very low inflammatory environment, Ag-specific CD8 T cells do not down-regulate IL-7Rα expression as dramatically as when they are primed in a more highly inflammatory setting (13, 38). Taking these data together, it appears that IL-7Rα expression may be incorporated into the programmed response of T cells, which is dictated by the priming event. Our data, in combination with others, implies that we should reconsider the idea that IL-7/IL-7Rα interactions are a selective mechanism for memory T cell precursors. Expression of IL-7Rα by effector cells is not the only key factor to promote transition from the effector to memory phase, but remains critical to support the long-term survival of memory cells. We thank Dr. Chengyu Liu (Transgenic Core Facility, National Heart, Lung, and Blood Institute, National Institutes of Health, Bethesda, MD) for performing the oocyte injection and establishing IL-7Rα transgenic line, and Dr. Dan Littman (New York University School of Medicine, New York, NY) for providing the CD4 enhancer/promoter transgenic vector. We also thank Rebecca Podyminogin (University of Iowa, Iowa City, IA) for excellent laboratory assistance. 1 This work was supported by National Institutes of Health Grants AI42767, AI46653, and AI50073 (to J.T.H. ), and American Cancer Society Grant PF-05-142-01-LIB (to J.S.H.). 3 Abbreviations used in this paper: WT, wild type; Tg, transgenic; DP, double positive; p.i., post infection; ICS, intracellular cytokine staining; LLO, listeriolysin O.
Goldrath, A. W., P. V. Sivakumar, M. Glaccum, M. K. Kennedy, M. J. Bevan, C. Benoist, D. Mathis, E. A. Butz. 2002. Cytokine requirements for acute and basal homeostatic proliferation of naive and memory CD8+ T cells. J. Exp. Med. 195: 1515-1522. Huster, K. M., V. Busch, M. Schiemann, K. Linkemann, K. M. Kerksiek, H. Wagner, D. H. Busch. 2004. Selective expression of IL-7R on memory T cells identifies early CD40L-dependent generation of distinct CD8+ memory T cell subsets. Proc. Natl. Acad. Sci. USA 101: 5610-5615. Xue, H. H., P. E. Kovanen, C. A. Pise-Masison, M. Berg, M. F. Radovich, J. N. Brady, W. J. Leonard. 2002. 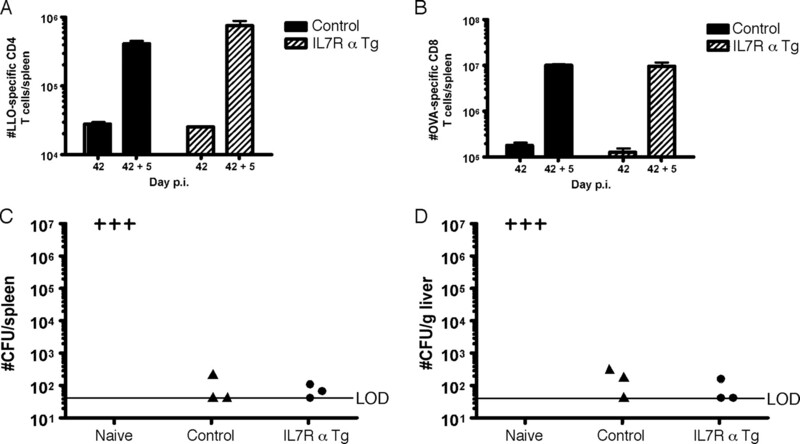 IL-2 negatively regulates IL-7Rα-chain expression in activated T lymphocytes. Proc. Natl. Acad. Sci. USA 99: 13759-13764. DeKoter, R. P., H. J. Lee, H. Singh. 2002. PU. 1 regulates expression of the interleukin-7 receptor in lymphoid progenitors. Immunity 16: 297-309. Xue, H. H., J. Bollenbacher, V. Rovella, R. Tripuraneni, Y. B. Du, C. Y. Liu, A. Williams, J. P. McCoy, W. J. Leonard. 2004. GA binding protein regulates interleukin 7 receptor α-chain gene expression in T cells. Nat. Immunol. 5: 1036-1044. Lacombe, M. H., M. P. Hardy, J. Rooney, N. Labrecque. 2005. IL-7R expression levels do not identify CD8+ memory T lymphocyte precursors following peptide immunization. J. Immunol. 175: 4400-4407. Badovinac, V. P., K. A. Messingham, A. Jabbari, J. S. Haring, J. T. Harty. 2005. Accelerated CD8+ T-cell memory and prime-boost response after dendritic-cell vaccination. Nat. Med. 11: 748-756. Wojciechowski, S., M. B. Jordan, Y. Zhu, J. White, A. J. Zajac, D. A. Hildeman. 2006. Bim mediates apoptosis of CD127lo effector T cells and limits T cell memory. Eur. J. Immunol. 36: 1694-1706. Hand, T. W., M. Morre, S. M. Kaech. 2007. Expression of IL-7Rα is necessary but not sufficient for the formation of memory CD8 T cells during viral infection. Proc. Natl. Acad. Sci. USA 104: 11730-11735. Osborne, L. C., S. Dhanji, J. W. Snow, J. J. Priatel, M. C. Ma, M. J. Miners, H. S. Teh, M. A. Goldsmith, N. Abraham. 2007. Impaired CD8 T cell memory and CD4 T cell primary responses in IL-7Rα mutant mice. J. Exp. Med. 204: 619-631. Seddon, B., P. Tomlinson, R. Zamoyska. 2003. Interleukin 7 and T cell receptor signals regulate homeostasis of CD4 memory cells. Nat. Immunol. 4: 680-686. Dooms, H., K. Wolslegel, P. Lin, A. K. Abbas. 2007. Interleukin-2 enhances CD4+ T cell memory by promoting the generation of IL-7Rα-expressing cells. J. Exp. Med. 204: 547-557. Sawada, S., J. D. Scarborough, N. Killeen, D. R. Littman. 1994. A lineage-specific transcriptional silencer regulates CD4 gene expression during T lymphocyte development. Cell 77: 917-929. Pope, C., S. K. Kim, A. Marzo, D. Masopust, K. Williams, J. Jiang, H. Shen, L. Lefrancois. 2001. Organ-specific regulation of the CD8 T cell response to Listeria monocytogenes infection. [Published erratum appears in 2001 J. Immunol. 166: 5840.]. J. Immunol. 166: 3402-3409. Tvinnereim, A. R., S. E. Hamilton, J. T. Harty. 2002. CD8+ T-cell response to secreted and nonsecreted antigens delivered by recombinant Listeria monocytogenes during secondary infection. Infect. Immun. 70: 153-162. Harty, J. T., M. J. Bevan. 1995. Specific immunity to Listeria monocytogenes in the absence of IFN γ. Immunity 3: 109-117. Harty, J. T., M. J. Bevan. 1992. CD8+ T cells specific for a single nonamer epitope of Listeria monocytogenes are protective in vivo. J. Exp. Med. 175: 1531-1538. Jabbari, A., J. T. Harty. 2006. Simultaneous assessment of antigen-stimulated cytokine production and memory subset composition of memory CD8 T cells. J. Immunol. Methods 313: 161-168. Badovinac, V. P., J. T. Harty. 2000. Intracellular staining for TNF and IFN-γ detects different frequencies of antigen-specific CD8+ T cells. J. Immunol. Methods 238: 107-117. Haring, J. S., G. A. Corbin, J. T. Harty. 2005. Dynamic regulation of IFN-γ signaling in antigen-specific CD8+ T cells responding to infection. J. Immunol. 174: 6791-6802. Sudo, T., S. Nishikawa, N. Ohno, N. Akiyama, M. Tamakoshi, H. Yoshida. 1993. Expression and function of the interleukin 7 receptor in murine lymphocytes. Proc. Natl. Acad. Sci. USA 90: 9125-9129. Fry, T. J., C. L. Mackall. 2001. Interleukin-7: master regulator of peripheral T-cell homeostasis?. Trends Immunol. 22: 564-571. Munitic, I., J. A. Williams, Y. Yang, B. Dong, P. J. Lucas, N. El Kassar, R. E. Gress, J. D. Ashwell. 2004. Dynamic regulation of IL-7R expression is required for normal thymopoiesis. Blood 104: 4165-4172. Sun, J. C., S. M. Lehar, M. J. Bevan. 2006. Augmented IL-7 signaling during viral infection drives greater expansion of effector T cells but does not enhance memory. J. Immunol. 177: 4458-4463. Li, J., G. Huston, S. L. Swain. 2003. IL-7 promotes the transition of CD4 effectors to persistent memory cells. J. Exp. Med. 198: 1807-1815. Park, J. H., Q. Yu, B. Erman, J. S. Appelbaum, D. Montoya-Durango, H. L. Grimes, A. Singer. 2004. Suppression of IL7Rα transcription by IL-7 and other prosurvival cytokines: a novel mechanism for maximizing IL-7-dependent T cell survival. Immunity 21: 289-302. Tripathi, P., T. C. Mitchell, F. Finkelman, D. A. Hildeman. 2007. Cutting edge: limiting amounts of IL-7 do not control contraction of CD4+ T cell responses. J. Immunol. 178: 4027-4031. Klonowski, K. D., K. J. Williams, A. L. Marzo, L. Lefrancois. 2006. Cutting edge: IL-7-independent regulation of IL-7Rα expression and memory CD8 T cell development. J. Immunol. 177: 4247-4251. Badovinac, V. P., B. B. Porter, J. T. Harty. 2004. CD8+ T cell contraction is controlled by early inflammation. Nat. Immunol. 5: 809-817.